EXPERT GAMING ON THE GO! Very Engaging - Playing a mobile game with 4 fingers to raise and satisfy your gaming experience, perfect for first-person shooting games! High-Quality Shooting Triggers - Transparent design avoids screen blocking, conductive rubber, and the alloy buttons ensure a speedy and sensitive response. Comfortable Grip - Ergonomic design provides a comfortable feeling to eliminate hand fatigue for the long-time gamer. It also allows gamers to charge and plug in earphones while playing. 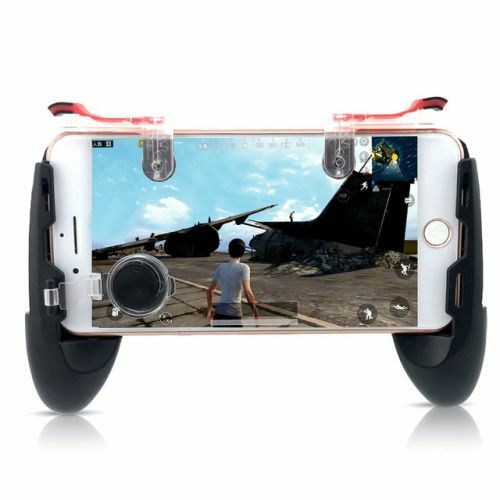 Wide Compatibilty - Compatible with all touch-screen smartphones, Its "egg-like" shape can be separated and assembled into a stretchable grip that fits any smartphone from 4.5 inches to 6.5 inches. Easy to Use, Easy to Carry – Light and small, Simply separate the "egg", stretch it to the size of your phone, put the clips on top of your device and you are ready to go!